Do I need <class> elements in persistence.xml? But when I remove <class> elements application doesn't see entities (all classes are annotated with @Entity). Is there any automatic mechanism to scan for @Entity classes? <description>This unit manages orders and customers. therefore be deployed to any persistence provider. This file defines a persistence unit named OrderManagement, which uses a JTA-aware data source jdbc/MyOrderDB. The jar-file and class elements specify managed persistence classes: entity classes, embeddable classes, and mapped superclasses. The jar-file element specifies JAR files that are visible to the packaged persistence unit that contain managed persistence classes, while the class element explicitly names managed persistence classes. In the case of Hibernate, have a look at the Chapter2. Setup and configuration too for more details. If it is not intended that the annotated persistence classes contained in the root of the persistence unit be included in the persistence unit, the exclude-unlisted-classes element should be used. The exclude-unlisted-classes element is not intended for use in Java SE environments. In Java EE environments, you do not have to do this as the provider scans for annotations for you. Unofficially, you can try to set <exclude-unlisted-classes>false</exclude-unlisted-classes> in your persistence.xml. This parameter defaults to false in EE and truein SE. Both EclipseLink and Toplink supports this as far I can tell. But you should not rely on it working in SE, according to spec, as stated above. Do I need Class elements in persistence.xml? 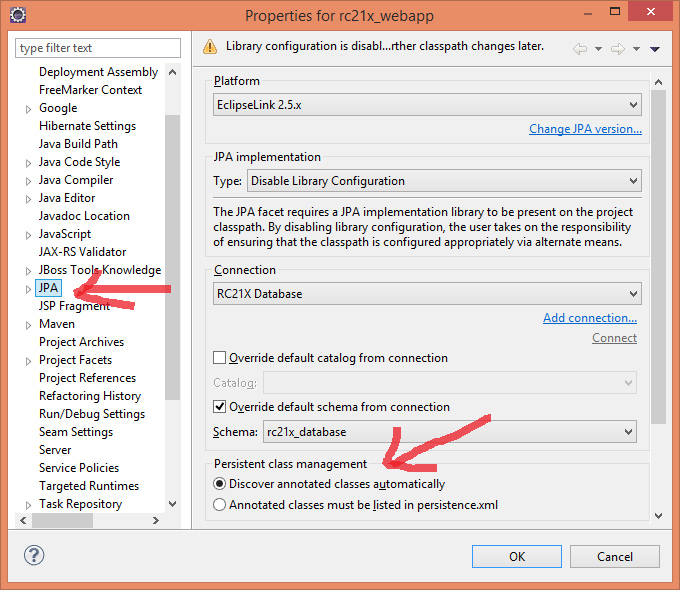 Right click on the project, click Properties, select JPA, in the Persistence class management tick Discover annotated classes automatically. For those running JPA in Spring, from version 3.1 onwards, you can set packagesToScan property under LocalContainerEntityManagerFactoryBean and get rid of persistence.xml altogether. Hibernate doesn't support <exclude-unlisted-classes>false</exclude-unlisted-classes> under SE, (another poster mentioned this works with TopLink and EclipseLink). There are tools that will auto-generate the list of classes to persistence.xml e.g. the Import Database Schema wizard in IntelliJ. Once you've got your project's initial classes in persistence.xml it should be simple to add/remove single classes by hand as your project progresses. Not sure if you're doing something similar to what I am doing, but Im generating a load of source java from an XSD using JAXB in a seperate component using Maven. Lets say this artifact is called "base-model"
I wanted to import this artifact containing the java source and run hibernate over all classes in my "base-model" artifact jar and not specify each explicitly. Im adding "base-model" as a dependency for my hibernate component but the trouble is the tag in persistence.xml only allows you to specify absolute paths. The way I got round it is to copy my "base-model" jar dependency explictly to my target dir and also strip the version of it. So whereas if I build my "base-model" artifact it generate "base-model-1.0-SNAPSHOT.jar", the copy-resources step copies it as "base-model.jar". I tried to use org.springframework.orm.jpa.LocalContainerEntityManagerFactoryBean with setting persistenceXmlLocation but with this I had to provide the <class> elements (even if the persistenceXmlLocation just pointed to META-INF/persistence.xml). When not using persistenceXmlLocation I could omit these <class> elements. I'm not sure this solution is under the spec but I think I can share for others. Contains entity classes only. No META-INF/persistence.xml. Depends on my-entities. Contains EJBs only. Depends on my-services. Contains resource classes and META-INF/persistence.xml. How can we specify <jar-file/> element in my-resources as the version-postfixed artifact name of a transient dependency? How can we sync the <jar-file/> element's value and the actual transient dependency's one? I put a property and a dependency in my-resources/pom.xml. With the dependencyConvergence rule, we can assure that the my-entities' version is same in both direct and transitive. Not the answer you're looking for? Browse other questions tagged java hibernate orm jpa annotations or ask your own question. Must every Entity Bean be registered in persistence.xml? Is there a way to scan JPA entities not to declare persistent classes in a persistence.xml file? How to create repository for more than one entity? how to reference XSD Schema location while parsing XML Doc via SAX Xerces?